Jobs Description: AJKPSC Advertisement 01/2019 is given below on our site. Visit our site to view AJKPSC Advertisement 01/2019. 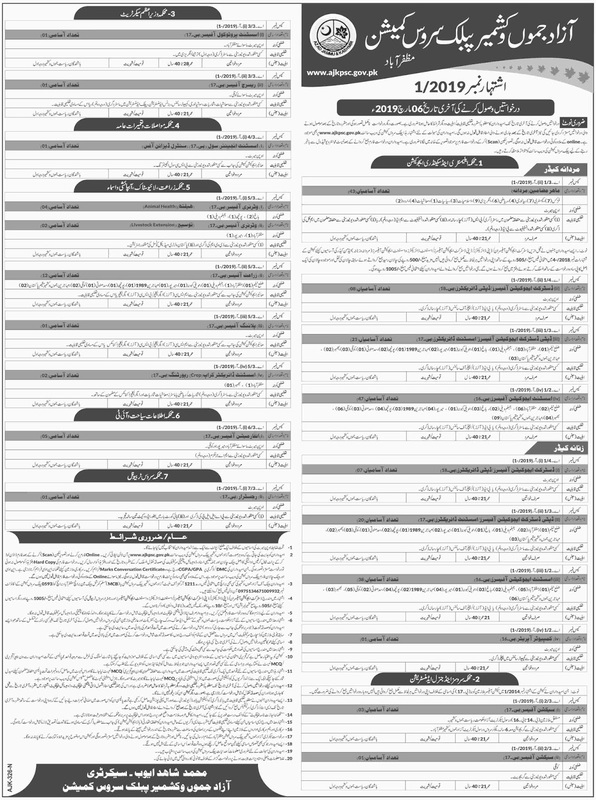 Azad Jammu & Kashmir Public Service Commission recently announced an advertisement for Jobs in Elementary & Secondary Education Department, Services and General Administration Department, Prime Minister Secretariat Department, Communication & Works Department, Agriculture, Livestock & Irrigation Department, Information, Tourism & IT Department, and Service Tribunal Department. AJKPSC Jobs February 2019 is given below as per department name. Azad Jammu & Kashmir Public Service Commission (AJKPSC) has required the applications for the following jobs. How To Apply: The interested candidates may apply online through the Azad Jammu & Kashmir Public Service Commission official website. Applications other than online will not be accepted.